This broad-ranging Companion comprises original contributions from leading Platonic scholars and reflects the different ways in which they are dealing with Plato's legacy. Covers an exceptionally broad range of subjects from diverse perspectives. Contributions are devoted to topics, ranging from perception and knowledge to politics and cosmology. Allows readers to see how a position advocated in one of Plato's dialogues compares with positions advocated in others. Permits readers to engage the debate concerning Plato's philosophical development on particular topics. 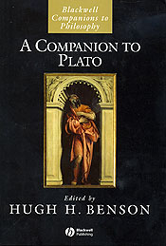 Also includes overviews of Plato's life, works and philosophical method.